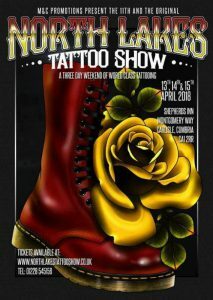 North Lakes Tattoo Show will take place in April 2018 in Carlisle. First of all two artists will attend from our studio on this either small yet more friendly tattoo show. Endre the owner of Tattooend and Evi our Junior artist, who used to be Endre’s apprentice. Endre loves to go to the North Lakes Tattoo show each year. In addition last year the organisers extended the Show with an extra day, so now we/you can enjoy it for 3 days! Wohooo!!! Get yourself booked with him if you are local, or if you love to travel.